I realize it’s a little unorthodox to bring oranges to dinner, but it’s a Doodlewash dinner, after all, and I never claimed to be orthodox hehe. Hey, it’s gluten free, corn free and GMO free, and that’s about all that matters! I hope you enjoy. This one is 5 x 7″ on a canvas panel. The very talented Charlie at Doodlewash is painting food items all month, and if you’d like to join him, just tag your artwork #doodlewashdinner and he will do a recap of everyone’s entries at the end of the month! Try not to visit when you’re hungry, as sometimes I’m tempted to lick the screen after viewing Charlie’s wonderful work! Like Charlie, I am really enjoying making a small painting every day. It is good for the soul. We were born to be creators, so please, create away! And don’t forget to shake thy tailfeather while doing it! Peace. Thanks so much, so glad you enjoyed it Kerfe! Thanks so much, Rebecca! Really appreciate your comments, as always! Thanks so much, Cathe! Much appreciated! ….. it has such an enticing twist, adding to its allure–and now you’ve got me googling orange chicken recipes! Ooh, I may show up for dinner! Thanks so much, Lance, so glad you enjoyed this! You know how to get me…just put blue and orange together in a painting and I’m in! I love oranges. And don’t throw away the peel. That’s the best part, you know. Yeah, people think I’m weird. They’re probably right. Thanks for sharing this colorful “doodle”. Thanks so much, Judith! Aren’t complementary colors fun? So glad you enjoyed this. Just think how many blue and orange paintings are waiting for you in your future! Endless! Yes, complementary colors are always fun, but for some reason it’s blue and orange that always gets me. I think red and green makes me think “Christmas” too much, and yellow and violet sometimes seems a little too extreme for my taste. But blue and orange! Just right. I’m sure I’ll be painting a lot with those two hues. That is gorgeous, almost abstract in its focus on form and colour. Nice! Thanks so much, Michael! I’m so glad you enjoyed it! Some nice, bold strokes and the colours work together too. Thanks so much, Graham! Really appreciate you popping in! Wow!! This is awesome!! What a wonderful gift to wake up to this morning!! This is a gorgeous piece!! And unorthodox is what a doodlewash dinner is all about! Hehe… Thanks for bringing this!! Yay!! This is really wonderful Laura! !😍😍Beautifully painted with rich gorgeous color. Love it!!!! Your orange painting is wonderful, Laura – abstract realism all at once. Fabulous color! I enjoy your orange painting and will have an orange after dinner. Woot! So glad to be able to spread the orange goodness around! Thanks, C, so happy you love this one! Thanks so much Stephen! So glad you like this one! I so appreciate your comment, Stephen. I’ll explain this weekend, but my daughter actually painted this in oil as a high school senior during a 30-minute painting exercise. I’ve always loved it. Her last HS art teacher was unkind and demoralized many of her students. She did know how to teach from a mechanics standpoint, but that was about it. I asked my daughter’s permission to post her painting on my blog, because I wanted her to have a chance to review the generous feedback so many of my friends, including you, tend to give. I was so pleased with how well her painting was received here, and I am really hoping that she will paint again. Thank you most warmly for your encouraging words, both to my daughter and to me. I hope you are framing this and hanging it in your kitchen Laura! Vibrant colors are awesome. Keep painting!!! Thanks so much, Sharon! I just might! Thanks, Margaret! Yes, it is helpful to have the sizes because it’s so hard to tell on the PC screen! I can’t imagine ever working large. I’d love to start though. Glad you enjoyed this painting! I’ve never seen such bright colours! I love how you’ve used the background too – those lovely dark blues really throw the orange right at us – Dangerous stuff – and I love it! Thanks so much, Jacob! Blue and orange are so wonderful against each other, aren’t they? They may be the best pair of all of the compliments. Although I do love yellow & purple as well. Glad you enjoyed this! Sorry Laura! I gotta keep it real. This is not my favorite but, it does capture the spirit of my compost pile in the backyard. Orange you glad I am honest! Ha! 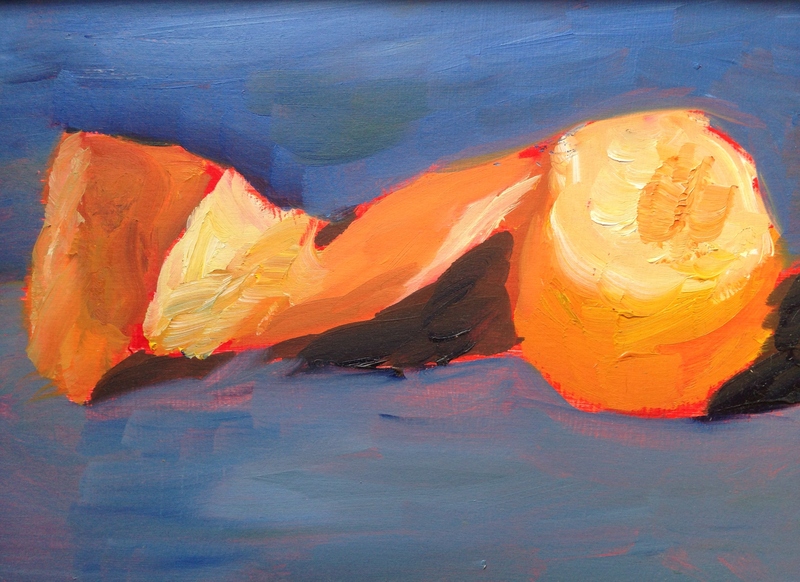 Beautiful work Laura, nice harmony has been created – the blue background is a great way to show off the orange. Thanks so much, Mary! I really do love those two colors together. Even blue and yellow are great. So glad you enjoyed this! Love it! Orange is a fun color! Thanks, Catherine! It is full of energy! Thanks so much, Rebecca, I was wondering what you’d think of this one! Thanks so much, Snehal! Really glad you enjoyed this one! I hope you got to eat one, Myriam! Glad you liked this one! It really is brilliant, so simple and direct. Great job. I’d hang this in my kitchen, preferably with the addition of a lemon, a lime, and an ugli fruit. N.
Sounds scrumptious, and thanks so much, Nina, for your comment! So glad you like this! Almost edible Laura but is it certified organic? Why did I think that Oz had outlawed GMOs. Is it just certain areas? Or was I mistaken? I don’t know how those execs sleep at night, honestly. I love the brushstrokes and love the colors! Thanks, Eileen! I’m gonna let out a little secret this weekend…..this was actually a 30-minute oil painting my daughter did in her senior year of high school! So glad you enjoyed it! This is such a brilliant painting when enlarged. If your daughter made this please encourage her to keep on painting. I taught high school art for 25 years…I know creative potential when I see it…your daughter has the Touch! Thank you very much! I passed your comment on to her. She loved art through high school, but in her senior year, she had a teacher who taught mechanics well, but crushed the spirits of many of her students. This woman managed to convince her she had no talent! I posted this because I had a feeling it would get wonderful feedback from my artist friends, and thanks to you and others who took the time to comment, it did. I am most grateful for your comments, both on this painting and on my other work. You are a wonderful, encouraging presence, and I just wish that every art teacher was exactly like you. Again, thank you. It’s really sweet that you posted your daughter’s painting incognito so that she could hear the praises. I hope it encourages her to resume painting. Sometimes people who teach have hang ups of their own which they begin projecting onto the students. So when you really love something and want to learn it, sometimes you have to find that inner drive inside yourself because even under the best circumstances you’ll encounter critics, and some critics can be really nasty. Ugh. A pox on ’em. Tell your daughter that her blue and orange is really delightful. Maybe the beauty of things in the world will tug at her and make her want to record her visual thoughts again. I hope so, very much, thank you Aletha for your warm encouraging words. I’ll definitely pass them along to her. Much appreciated.